A study to evaluate the microbial quality of goat carcasses at Chinsapo-2 and Chigwirizano slaughter slabs in Lilongwe District, Malawi, was conducted in June 2014. A total of 154 swab samples were collected from 34 carcasses for identification of the isolates and bacterial total viable counts (TVCs). Cotton swab samples were also collected from clothes, knives and hands of butchers and water used in the slaughter process. The study found that predominant bacterial isolates at Chinsapo-2 were E. coli (29%), followed by Bacillus spp. (18%), Proteus spp. (15%) and Klebsiella spp. (13%). On the other hand, bacterial isolates from Chigwirizano were E. coli (38%), followed by Bacillus spp. (23%), Proteus spp. (13%) and Klebsiella spp. (5%). The mean bacterial TVC before treatment (washing hands, clean knives with hot water and provision of working gear) for Chinsapo-2 were 6.74 ± 0.38, 6.38 ± 0.38 and 8.26 ± 0.38, while Chigwirizano had 9.48 ± 0.50, 9.48 ± 0.50 and 8.24 ± 0.50 log10 CFU/cm2. After treatment, Chinsapo-2 recorded 8.03 ± 0.38, 7.67 ± 0.38 and 7.30 ± 0.38 log10 CFU/cm2 on hands, knives and clothes while Chigwirizano had 7.12 ± 0.50, 8.84 ± 0.50 and 8.73 ± 0.50 log10 CFU/cm2, respectively. Washing hands with tap water before slaughter significantly (P < 0.05) reduced bacterial load on the hands of workers at Chigwirizano and not at Chinsapo who used shallow well water. Mean TVCs for flanks, fore leg, brisket and rump for Chinsapo-2 were 7.17 ± 0.38, 5.98 ± 0.38, 5.74 ± 0.38 and 5.63 ± 0.38 log10 CFU/cm2, respectively, before treatment. After treatment, Chinsapo-2 had 6.97 ± 0.38, 5.75 ± 0.38, 6.27 ± 0.38 and 5.90 ± 0.38 log10 CFU/cm2. On the other hand, before treatment, Chigwirizano recorded 6.34 ± 0.50, 5.83 ± 0.50, 5.75 ± 0.50 and 6.40 ± 0.50 log10 CFU/cm2 and after treatment the log10 CFU/cm2 were 8.22 ± 0.50, 6.43 ± 0.50, 6.17 ± 0.50 and 6.94 ± 0.50 on the four carcass sites. The study revealed that the level of contamination on goat carcasses in Lilongwe was extremely high exceeding the acceptable international standards for swab values which are <2.8 log CFU/cm2 for TVC, and the unacceptable values are >4.3 log CFU/cm2. Therefore, further studies should be conducted to reduce the bacterial contamination. Carcass contamination during slaughter is the major source of both pathogenic and spoilage microorganisms. Carcass contamination practices include the use of unsterilised and improperly cleaned knives and equipments, dressing of carcass on filthy slaughter floors and hanging of meat in open places overnight . In most cases, personal hygiene is highly compromised as people who are slaughtering animals rarely appear to wash their body or hands and use their own clothes without protective clothing . For instance, World Food Logistics Organisation (WFLO)  reported that 70% of slaughters in Malawi are carried out in the open, on a slab or hanging under a tree. These slaughtering conditions and meat handling are not up to standard and lead to quality deterioration coupled with food borne diseases, which may endanger human health . Meat products coming from such conditions often deteriorate due to bacterial contamination, especially in warm climates  like Malawi. Many researchers have isolated and identified heterogeneous types of microflora from fresh meat and this is backed by limited studies on carcass microbiological quality of goat meat appearing in literature . So far, no studies have been reported on microbial quality of goat meat in Malawi. Therefore, this study was designed to assess the microbiological profile of goat carcasses and water used in both formal and informal slaughter slabs thereby evaluating sanitary quality of goat meat sold to consumers in Lilongwe, Malawi. The swab samples were collected from Chinsapo-2 and Chigwirizano slaughter slabs. Chinsapo-2 is an informal slaughter slab, while Chigwirizano is a formal slaughter slab with slaughter facilities and meat inspection in place. These markets are located closer to a private abattoir, Lilongwe Cold Storage Company owned by Central Poultry (2010) Limited. A total of 154 swab samples from 34 goat carcasses were collected including knives, water and clothes in contact with meat. The swab samples were collected by a Laboratory Technician from the Central Veterinary Laboratory (CVL). The study was conducted in June 2014, which is the cold–dry season in Malawi, and the samples were collected between 06:00 and 07:00 h in the morning. The samples were collected for four (4) consecutive days. On the first 2 days the butchers were left to follow what they normally do (before treatment): like washing or not washing hands and knives, using unboiled water, eviscerating carcasses on the ground and putting on their own clothes to act as a control. Whereas, on the other two (2) consecutive days they were provided with working gear which included gumboots, lab coats, head guards and overalls (after treatment). After treatment also included boiling water, immersing knives in the boiling water and washing hands in heated warm water since both the knives used for slaughtering and cutting or contaminated water are important sources of coliforms in meat . Sterile non-absorbent cotton wool was used in this study to collect samples from the sites. Carcass sites were sampled by the swab-technique on an area of 100 cm2 marked with a sterile frame (10 cm × 10 cm) for each site on the carcass according to Abdalla et al. . The swabs were collected from anatomical carcass sites that included the rump, flank, brisket and behind the fore leg in accordance with Nouichi and Hamdi . Before collection, the dry wool was moistened with 0.1% peptone water and rubbed firmly on material to be swabbed by making parallel strikes at right angles then transferred into separate sterile containers with 0.1% peptone solution and put in the cooler box to the laboratory. At the laboratory, the serial dilutions were made using sterile diluents, i.e. 10−1, 10−2 and 10−3. Each serial solution was mixed with sterile Viable or Plate Count Agar, which were then incubated for 18–24 h at 37 °C. The presence of microorganisms was confirmed on viable count agar by first subculturing the viable bacteria into sterile blood agar and MacConkey agar. The plates were incubated for 18–24 h. Actual confirmation of the bacteria was done by performing primary and biochemical tests in the Laboratory at CVL. The colonies on the plates were interpreted as follows: <30 were too few to count; 30–300 countable and >300 too many to count. The counts were expressed as log CFU/cm2 by using the formula CFU/cm2 = No of colonies × level of serial dilution × factor bringing plated vol. to 1 ml as described by Adetunji and Odetokun . Water samples from tap and unprotected sources were collected for bacteriological analysis according to APHA, WWA and WEF  to estimate the number of Coliforms bacilli in 100 mls of water using the presence–absence (P–A) method. The method was chosen because the focus was the positive detection of Escherichia coli, regardless of quantity; as the guideline for E. coli in drinking water is none per 100 mL, and qualitative results are sufficient for protecting public health . The samples were analysed at the Central Veterinary Laboratory (CVL) using MacConkey broth single/double strength with Durham tubes to trap gas. Positive results indicated the growth of the bacilli (coliform). The samples were then incubated at 37 °C for 24 h in water bath and presumptive positive results were indicated by the presence of acid/gas in the medium. The negative samples were re-incubated for more hours again. To ascertain whether coliform bacilli detected in presumptive test were E. coli or not, the positive samples in the presumptive results were subcultured on fresh MacConkey broth single strength, in peptone water broth and Glucose phosphate broth. The samples were then incubated at 44 °C in a water broth for 24 h then tested for indole in peptone water broths. The positive indole bottles were arranged properly and E. coli counts were found easily using the most probable number (MPN) chart. The results showed presence of E. coli in unprotected well water and no E. coli in tap water. Y ijk = microbial count, µ = overall mean, T i = effect of treatment (before and after treatment), S j = effect of site (1 = Chinsapo-2, 2 = Chigwirizano), (TS)ij = interaction between treatment and site, E ijk = random error. The data were analysed using SPSS software (Statistical Package for the Social Sciences, 17 version, SSPS Inc. and Chicago, IL, USA). All bacterial counts were converted to log10 Colony Forming Unit (CFU)/cm2 for analysis and ANOVA was performed. Statistical significance was set at a P value of <0.05. The presence of bacteria in meat has been widely reported from different parts of the world [13, 16]. The present study has revealed ten types of bacteria with their frequency of contamination as shown in Fig. 1. The highest relative frequencies of predominant bacteria isolated at Chinsapo-2 were E. coli (29%), followed by Bacillus spp. (18%) and Proteus spp. (15%) and Klebsiella spp. (13%). On the other hand, predominant bacteria isolated at Chigwirizano were E. coli (38%), followed by Bacillus spp. (23%) and Proteus spp. (13%) and Klebsiella spp. (5%). Table 1 shows the mean TVC for hands of workers, knives used during slaughter and clothes of carcass handlers before and after treatment. It was observed that TVCs for clothes were not significantly different (P < 0.05) in both sites, whereas TVC for hands was statistically different within the sites before and after treatment. However, TVCs for knives were statistically different at Chinsapo-2 only. Table 2 shows the mean TVC for different sites of the goat carcass: flank, fore leg, brisket and rump before and after treatment. Significant differences on different carcass parts before and after treatment were observed on the breast at Chinsapo-2 and on the flanks at Chigwirizano sites. The current results on microbial prevalence are in agreement with Iroha et al. who also found that the bacteria with highest rate of occurrence on meat sold in Abakaliki, Ebonyi State Nigeria was E. coli (8.0%) while the least one was S. aureus (1.3%). However, some of these microorganisms were reported to be opportunistic pathogens of humans and were isolated from human clinical specimens of an outbreak of food poisoning. For instance, E. coli are commonly used as surrogate indicator, whose presence in food generally indicates direct and indirect contamination with human or animal faeces . The contamination of E. coli occurs in meat through soiling of the carcass and plant environment with faecal materials during slaughter process. This contamination is mainly evident where slaughter procedures are not hygienic as what happens at Chinsapo-2 and Chigwirizano slaughter slabs. The results in the current agree with Jeffery et al. in bovine carcasses in Sudan whereby E. coli represented the highest average prevalence. Sudan and Malawi are tropical countries, with ambient temperatures conducive for the growth of microorganisms resulting in rendering meat unsafe for human consumption. From a public health point of view, the isolation of bacteria from Staphylococcus spp. is of concern as they can cause food poisoning due to neglect in storage and handling . They can be found in the air, dust, water and human faeces, and can be present on clothing and utensils handled by human. Staphylococci are a normal part of the microflora of the nose throat and skin and only S. aureus is considered to be pathogenic  and the nasal passage is the most significant site. The values on TVC for hands of workers, knives used during slaughter processes and clothes of carcass handlers before and after treatment found in this study (Table 1) are very high compared to studies carried out elsewhere. For instance Abdalla et al. found 3.74 ± 0.02 log10 CFU/cm2 on hands of workers in Sudan before skinning the goats which is lower than 6.74 ± 0.38 for Chinsapo-2 and 9.48 ± 0.50 log10 CFU/cm2 for Chigwirizano found in this study. In their study, they also found lower TVC of 3.40 ± 0.02 on knives against 6.38 ± 0.38 for Chinsapo 2 and 9.48 ± 0.50 for Chigwirizano in this study. Another study by Jeffery et al. revealed that the workers’ hands and the equipment were the sources of meat contamination and these results are in accordance with the present results. However, the TVC for knives before treatment is much lower than what was reported by Adetunji and Odetokun  who found 14.01 in tropical goat abattoir in Nigeria. 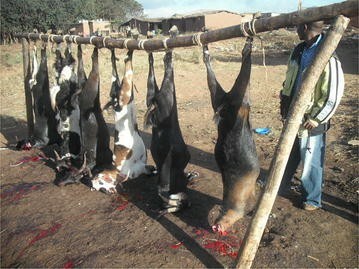 This simply means that meat handlers in Malawi are unhygienic when slaughtering goats and other animals (Figs. 2, 3). This also concurs with Adzitey et al. who reported that possible sources of contamination in beef cattle in Tamale Metropolis in the Northern Region of Ghana may come from the cutting knives, intestinal contents, meat handlers and the meat selling environment. The high values of microorganisms after treatment on hands and knives at Chinsapo-2 could be attributed to the water they used which was from unprotected water sources or from contamination with the environment soon after treatment. Another reason could be poor level of hygiene on the part of the butchers since they normally use the same knives throughout the line of processing of the carcasses. The higher values even after treatment on meat TVC for different sites of the goat carcass: flank, fore leg, brisket and rump (Table 2) indicate that there was unusual contamination on meat. Provision of working gear, use of boiled water and washing hands did not bring in any change on microbial count. Higher numbers of bacteria could be transmitted from the skin of goat to the carcass surfaces during flaying. This indicates that places are not hygienic to prevent any contamination of microorganisms on meat. However, there was a trend of higher contamination on the flanks as compared to foreleg, brisket and rump on both markets. This trend agrees with Ali  who recorded higher contamination levels on flank site and lower contamination levels on rump sites during skinning. The findings of this study show that meat hygiene standards in Lilongwe are low and unacceptable because they are above 4.3 log10 CFU/cm2 as recommended by Food Standards Agency (http://www.ukmeat.org/AssessmentCriteria.htm). The counts are also above what Nouichi and Hamdi  found in Algeria. In their study, they found that the average level of superficial bacterial contamination of ovine carcasses was 3.11 log CFU/cm2. Overall, the present study revealed that the level of contamination in the slaughter slabs was significantly higher compared to the reported values from developed countries. The findings of the present study reflected the hygienic status of meat production in the developing world . On the other hand, the study revealed that water from unprotected wells used during slaughter and processing of goat carcasses at both slaughter slabs was contaminated with E. coli. Tap and treated water was erratic in both sites, usually taps ran at night and dry out during the day when slaughters are done. This could be one of the reasons why E. coli was highest in proportion among all the bacteria since E. coli is abundant in all natural waters and soils subject to recent faecal contamination, whether from humans, wild animals or agricultural activity  and is the best indicator of water contamination by coliforms . Therefore, there is need to improve the slaughter slabs and extensive civic education to meat handlers in both formal and informal slaughter places in Lilongwe ADD and Malawi as a whole on proper slaughter and handling of meat. Further studies should be conducted in the regulated abattoirs in the country since no studies have been conducted before. Follow-up studies would be on methods to reduce contamination involving all stakeholders in the livestock industry from district council, butchers and consumers. The study revealed that the level of contamination on goat carcasses was extremely high exceeding the acceptable international standards for swab values which are <2.8 log CFU/cm2 for TVC, and the unacceptable values are >4.3 log CFU/cm2, respectively . Most of the treatments except washing hands with clean portable water at Chigwirizano before handling the meat, did not significantly reduce the TVC, indicating that the environment in which these goats were slaughtered were not hygienic. The study also revealed that contamination includes microorganisms, which are capable of food poisoning in humans and that the sources of contamination included water, hands and clothes of workers. The presence of high coliform bacteria counts even in water suggested that meat marketed in Lilongwe is not fit for human consumption. The district assembly in collaboration with the Department of Animal Health and Livestock Development should ensure that butchers are organised and have improved slaughter slabs or close down these unregulated slabs and use private abattoirs within the city. However, there is need to negotiate on affordable slaughter charges. Therefore, further studies on methods of reducing contamination should be conducted in the slaughter places. Corresponding author JT in this article was the MSc student and was the overall in-charge of all activities while the three authors were supervisors to the student providing guidance to the student. For instance Prof. JPM was the major supervisor who also advised on nutrition of goats, Prof. RRKDP advised on growth and carcass characteristics whereas Dr. WMM, a Veterinarian, played a part on microbial quality of goat carcasses. This article is just part of the MSc thesis which focused of microbial quality of goat carcasses. All authors read and approved the final manuscript. The study was a component of Master of Science in Animal Science thesis and was supported by Goat Value Project under Agriculture Research and Development Program (ARDEP). Many thanks to Professor Frik Sundstol and Lars Eik for their contributions in the set-up of the experiments. Special thanks go to the supervisory committee: Professor J.P. Mtimuni, Dr. M.W. Mfitilodze and Professor R.K.D. Phoya for their guidance and advice throughout the research and write-up period. Many thanks also go to the people at the Small Animal Unit, Group Village Headman (GVH) Zidana, Mr. Kwamdera, the Laboratory Technician at Central Veterinary Laboratory, Mr. Kubwalo, Assistant Veterinary Officer for Likuni Dip Tank and all butchermen who participated in the swab sample collection at Chigwirizano and Chinsapo 2 markets and all colleagues in the department of Animal Science for their support throughout the project. The data are available for this work and remain under control of the corresponding author as a student and the funding agency, Agriculture Research and Development Program (ARDEP). The other authors in this study were supervisors to the corresponding author and provided their consent to publication of this work. Not applicable at the institution when this study was being conducted. The research was in partial fulfilment of the Master of Science in Animal Science at Bunda campus and was funded by Goat Value Project under Agriculture Research and Development Program (ARDEP). Adzitey F, Teye GA, Kutah WN, Adday S. Microbial quality of beef sold on selected markets in the Tamale Metropolis in the Northern Region of Ghana. In: Livestock research for rural development, vol. 23, Article #5. 2011. http://www.lrrd.org/lrrd23/1/kuta23005.htm. Accessed 21 Dec 2013. Health Canada. Guidelines for Canadian drinking water quality: guideline technical document—Escherichia coli. Water, Air and Climate Change Bureau, Healthy Environments and Consumer Safety Branch, Health Canada, Ottawa, Ontario. (Catalogue No H144-7/2013E-PDF). 2012. http://hc-sc.gc.ca/ewh-semt/pubs/water-eau/coliforms-coliformes/index-eng.php. Accessed 10 Oct 2013. Jeffery B, Donald AB, Gill CO. Implementation of validated HACCP system for the control of microbiological contamination of pig carcass at a small abattoir. 2003. http://www.ncbi.nlm.nih.gov/pmc/articles/PMC340019. Accessed 12 Oct 2013. World Food Logistics Organisation (WFLO). The integrated cold chain in Southern Africa. Assessment report and recommendations. 1500 King Street, Alexandria. 2005. http://webcache.googleusercontent.com/search?q=cache:SkFwBiMHOW8J:www.docstoc.com/docs/74321424/Marketing-Channel-Used-by-Cold-Chain-Industry+&cd=1&hl=en&ct=clnk. Accessed 5 May 2014.